Why Manila Got Hit By A Tornado—And Will It Happen Again? For the past few weeks, it has been raining non-stop in Metro Manila due to the Southwest Monsoon or habagat. Aside from heavy rains and flash floods, the severe weather condition that the country is experiencing caused a tornado to hit Manila on Sunday afternoon. The question now is, will it happen again soon? Yeah, I wanna know that; but first answer me this, how the hell did a tornado appear in our country? Tornadoes are not uncommon in the Philippines but we don’t see it as often as in other countries such as the US. In fact, an average of 12 to 24 tornadoes hit our country every year. Most are not caught on film, unlike the one that hit Manila, which is why people are not aware that tornadoes are common in the country. In case you're not too much of a science geek, tornadoes are funnel-shaped columns of air that comes from a thunderstorm and rotates violently on a narrow path of land. If it's not in contact with land, such as those originating from a body of water, the formation is called a "funnel cloud." These weather anomalies are usually formed when the air comes in contact with the surface of the Earth and a cumulonimbus cloud. Cumulonimbus clouds are extremely dark and dense and usually produce heavy rains, thunderstorms, or hailstorms. According to PAGASA, tornadoes can have a wind speed of more than 400 kilometers per hour and last for an estimated 30 minutes. Tornadoes also occur all over the world except Antartica. Majority of tornadoes occur in the US as well as Australia, Canada, and several countries in Europe. The geographic location of these territories plus the weather condition makes a perfect atmosphere to create tornadoes. According to ABS-CBN News' interview with PAGASA senior weather specialist Jun Galang, tornadoes in the country rarely form in urban areas like Metro Manila. They usually occur in areas with vast flat lands such as Mindanao, Central Luzon, Nueva Ecija, and even in Bulacan. Our tornadoes, he added, are often caused by the frequency of severe thunderstorms. Okay, wait up, but this one hit Manila?! Thunderstorms don't automatically mean that a tornado would appear. Weather conditions like warm moisture above land partnered with cold and dry air must be present to form a tornado. When the warm air creates an "updraft" or the pushing of air upwards, the wind changes direction from horizontal to vertical and creates a vortex. If the updraft of warm air is stronger, the rotation of the vortex also becomes stronger which eventually becomes the tornado. It just so happened that on that fateful day, Manila had been experiencing strong rains and concentrated clouds, making the atmosphere unstable. In addition, the urban air had been very warm and moist thus causing the tornado. Galang also noted that Philippine tornadoes are smaller than those experienced in other countries. Their small size makes them unable to be detected through satellite. Although the tornado that hit Manila was pretty small, it still left a hefty amount of damage to the areas it hit. The tornado apparently started in Brgy. 435 in Sampaloc at around 4:30 p.m. and lasted for 20 minutes. Barangay officials claimed that 20 houses were damaged as well as the newly constructed covered court, which doubles as the community's evacuation center, when the tornado passed. Luckily, only one person was injured. However, around a hundred houses and other establishments were damaged. Tornadoes are almost always unpredictable especially if it's small. Although hurricanes and severe thunderstorms can easily be detected, tornadoes are a different story. It might happen again but the conditions experienced last Sunday needs to be perfectly recreated in order to repeat a similar scenario. Factors such as temperature and weather condition need to be almost similar in order to brew up another tornado. However, let us not panic and assume that another thunderstorm would automatically make another tornado appear. What happened last Sunday was a case of "the perfect disaster," a mere coincidence to help educate ourselves on what to expect in case another tornado might show up. The better question would be "what are the signs that a tornado is coming?" 1) Be mindful of dark and low clouds. Look for a large lowering cloud formation which is a potential tornado sign. Beware especially if you see that it is actually rotating, even if it is slow. 2) If the sky becomes a greenish black color, it may be a sign that a tornado is coming. There is a lot of hail in thunderstorms which makes the light of the sun bounce off the hail, thus giving the sky a greenish color. 3) A loud roar, similar to a train is also a good sign that there is an impending tornado. Tornadoes give off a continuous noise, similar to a train, due to the velocity of the winds and the debris from the tornado. If in case you are unable to observe your surroundings, it is important to just be prepared for such a disastrous event. There are ways in which you can secure yourself from the coming disaster. Good. Shoot me those tips! 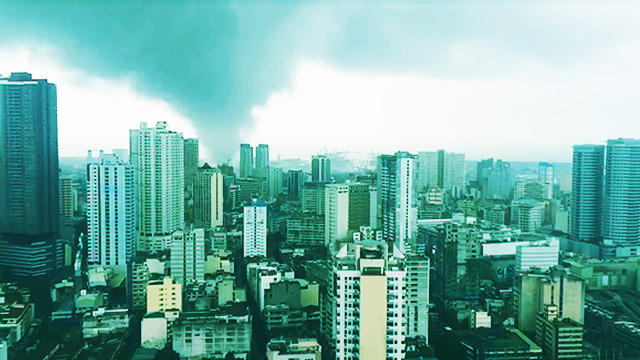 Tornadoes, such as the one that occurred in Manila, usually show up during the afternoon in areas with thick and heavy low-hanging clouds. The best way to protect yourself from it is to seek cover in the closest stable structure you could find. The best place to go is an interior room, possibly on the lowest floor, with no windows (ex. closet or bathroom). If you are in a car, you should immediately get out of it as it could get swept off by the passing tornado. If you are in an open area with no available shelter, you must lie flat on the ground. Also, check for any fallen power lines and injured people in the area. Remember, it’s always a good idea to do what you can to help others especially when there is a natural calamity.